Ignition Casino is new but already is making a name for itself with a big welcome bonus, games from many providers, and spectacular promotions. Ignition Casino is only one year old! It shares some of the best features of many new casinos. The first feature that makes Ignition Casino so much fun is its interface. They don’t burden you with a thousand words on the homepage, in a small font against a difficult background. Neither do they splash gaudy cartoon colors at you. Instead they announce the huge Ignition Casino welcome bonus! There aren’t yet many Ignition Casino reviews at sites like ours so we’re happy to analyze this exciting new casino for you. On the left side of the home page, they have an easy step by step set of instructions for how to get set up as player. 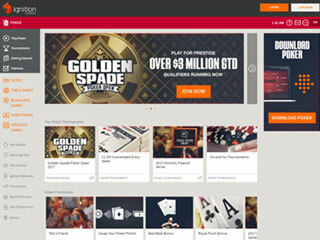 It’s never hard to open an online casino and Ignition Casino makes it especially easy. The enrollment process does have three drawbacks as listed above. First, the casino still doesn’t have the full complement of banking options that older, more established casinos have. Secondly, they have a $3000 limit on withdrawals in currencies other than Bitcoin but a $9500 limit on withdrawals in Bitcoin. We feel that there shouldn’t be such a discrepancy in withdrawal limits between Bitcoin and other currencies. Finally, they state on an inside page that they process withdrawals in as few as 5-10 days! They need to get the process down to 2-3 days. As a matter of fact, the withdrawal process for Bitcoins is only 3 days! Ignition Casino has many good features so we hope you to keep it in mind as a possible future casino option even if you choose to pass it by for now. The welcome bonus is actually two separate bonuses of 100% up to $1000. With both bonuses, you need to use the Ignition Casino bonus codes so make sure you do so and that you keep them straight. Nothing frustrates players more than a glitch in bonus codes. The rules state clearly that you have to claim your bonus at the same time you make your initial deposit so make sure you remember to put in your bonus code. The first Ignition Casino bonus is a straightforward bonus for new players. Unlike many casinos, that space their big welcome bonus across several deposit bonuses, Ignition Casino offers just the one massive first bonus. The second welcome bonus is also for 100% up to $1000 but it is restricted to poker. The specifics of this bonus are clearly explained but we suggest you contact Ignition Casino customer service just to be sure that you understood the bonus perfectly. The casino does not offer any no-deposit bonuses yet but likely will in the future. Then they will require you get your no deposit bonus by using the Ignition Casino no deposit bonus codes. Players use bonus codes in many online casinos; we simply tell you to be aware that you have to put the code in to get your bonus. The casino has 200 slots from several game providers. This is one of the biggest advantages of newer casinos: they don’t have exclusive contracts to offer games from only a single provider. So Ignition Casino has games from Real Time Gaming, Rival, Relax gaming, Random Logic Software, Genesis gaming and Betsoft. Every game provider produces some duds and by being able to offer games from so many providers, Ignition Casino can choose the best from each. In slots, this means superior graphics and animation in each game, great game play, interesting themes, and top winning bonus rounds. Ignition has 20 table games: blackjack, roulette, craps, baccarat, and poker. The tutorials explain in very clear language how to approach each game and what to do in many situations. So, players new to any game can learn as much as possible before wading in with real money. Ignition also runs a large selection of video poker. This game is fast becoming possibly the most popular casino game at many online casinos. Ignition has a nice introductory tutorial on video poker. The casino offers bingo, keno, scratch cards, sudoko and more under the specialty games category. Gamers love specialty games because they are simply fun. When you’ve been playing a heady game like poker or blackjack for a while a short respite in the specialty games section is very welcome. Ignition Casino poker tournaments are becoming famous simply by word of mouth. The casino runs several ongoing poker promotions. As we detailed above, the welcome package is big although we wish it were divided into more manageable pieces. The casino runs a loyalty program that is unusual because it has seven tiers as opposed to the far more common five tiers. This means that modest gamers can rise more quickly and can enjoy the benefits of being at a higher tier in the program. You get a $100 bonus for bringing a friend along. This is incentive enough to tell your friends all about Ignition Casino. 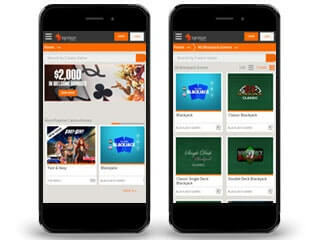 The casino offers download and mobile platforms. As is common with new casinos, the mobile is absolutely state-of-the-art. That’s because newer casinos understand that mobile is taking over the online casino gaming industry because of superior graphics making the extraordinary convenience of mobile perfect for quick gaming while on the go or waiting somewhere. All financial transactions are fully protected by encryption software that is as good as any presently available. As yet, Ignition casino has only email as a method of contacting them. They do answer mail quickly but they should quickly set up a call center so players can access them through chat and telephone as well. Most casinos offer a wide variety of ways to contact them and usually in a variety of subjects. Ignition has got to “get with the program” to keep up on this score. As a final word, we recommend that all players read the excellent articles in the “Hot Off The Press” section. Here is where the tutorials are but the casino also has many articles of useful information in addition to the tutorials. Clearly, Ignition Casino is a welcome new player on the block. Once they iron out their few drawbacks, they will be a much better casino.